Does the Traveler's Light shine brightly on Destiny 2, Activision and Bungie's sequel to their 2014 MMO shooter? Our review. Full disclosure before starting off this review: I did not play the original Destiny, at least not very much of it. Aside from press events and conventions, my time with Activision and Bungie's first attempt at a first-person shooter MMORPG was limited. In total, I had spent less than a few hours on 2014's Destiny. So I went into Destiny 2 with limited knowledge of the original and an open mind. And what I experienced was an enjoyable (albeit flawed) story-based campaign with a healthy variety of weaponry and a lot of activities to take part in with other players that happened to be passing by. It didn't take long before I felt hooked and had thoughts of, "Oh, so this must be what the fuss was about with the first game." It's a solid MMORPG that's just as enjoyable for solo players as it is for groups of friends. Given the way Destiny 2's campaign starts out, there's a sense that little about the first game's story actually matters. A massive brute named Dominus Ghaul leads a Red Legion invasion of the Last City, upending the Guardians and cutting off their connection to the Traveler and the power-bringing Light that it provides. While the intro mission familiarizes players with the game's controls and mechanics, it's the subsequent missions that offers up an emotional sense of powerlessness that helps establish the narrative. 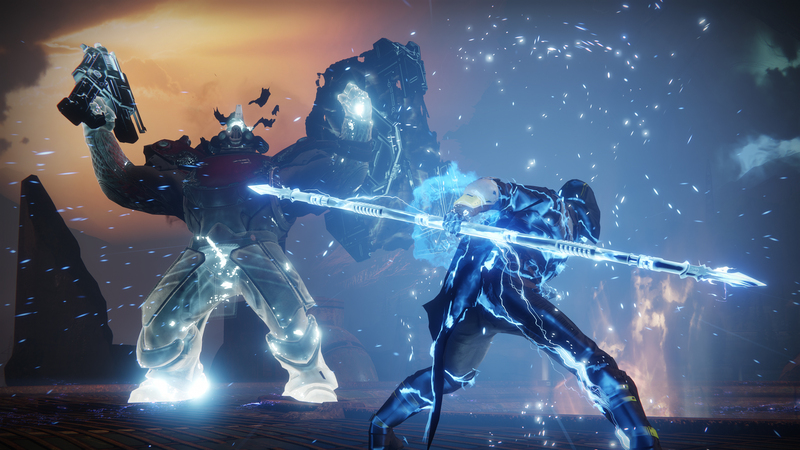 After regaining a connection with the Light and starting the campaign in earnest, it's easy to feel overwhelmed by the massive worlds that Bungie designed. 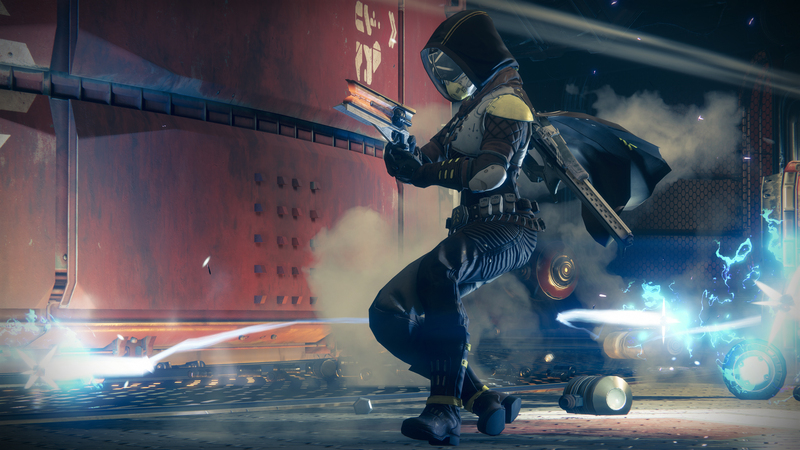 Fortunately, thanks to the numerous public events that players of all levels can take part of, it's easy for newcomers to become acclimated to how Destiny 2 works and how to go about finding better equipment. There's no limit to how many public events players can participate in with total strangers, offering a sense of comraderie, while also flying solo. One of the best moments of my early hours with Destiny 2 was in warding off a Vex assault by teaming up with other players to knock down some hulking six-legged walker mechs. It was nice to hang around with these people, knowing the solo-player campaign missions would still be waiting later. Speaking of the Vex, one of the things I had a problem with, in terms of Destiny 2's story it that it likes to toss out numerous enemy races, but does little to narratively distinguish them. There are instances in the game where two enemy factions will be fighting each other and I'll come to realize that they all look similar. The game does little to give these enemies an identity, providing little in the way of lore. Sure, Ghaul and the Red Legion get plenty of exposition through the campaign's stunningly beautiful cutscenes, but nothing else really makes Destiny 2 feel like a complete world, lore-wise. Side missions help little in that regard, though things do start to pick up with the post-campaign activities. The other issue I had with the campaign is that it feels unnecessarily padded. No, it's not just the level grinding. In fact, the grinding doesn't feel so terrible, thanks to the variety of side missions and public events that pack each of Destiny 2's worlds. It's actually the fact that the Sparrows don't unlock until after the campaign is over, meaning Guardians have to hoof it across these vast worlds to make it to their next mission. There are Fast Travel points available, but even those are often located a good distance from a mission marker. Getting across worlds takes a good chunk of time and is often a frustrating venture, especially since it's easy to get lost or get bombarded by enemy fire along the way. It artificially adds hours to the campaign and it gets to be aggravating after a while. There's no shortage of ways to pick up rare and exotic loot in Destiny 2 and it expands much more when the campaign is over. A smorgasbord of activities become available once the formal campaign ends, with players able to take part in Strikes, Patrols, Flashpoints, side missions, Raids, and more. Aside from the big Leviathan Raid, none of the activities take too much time and they feel substantially rewarding, especially when doing all of it as part of a clan. But while loot is plentiful, there are limited ways to customize that loot and show it off. Destiny 2's Shader system is needlessly limited, only allowing for one-time use to put a unique visual touch on a weapon or armor. Given that loot often drops like candy out of a piñata in Destiny 2, it doesn't take long to find the new hotness. However, at that point, the Shader application can't be undone and it's essentially wasted. That leads to hesitation to use Shaders that have been earned through gameplay and it means players like myself will hesitate more before customizing weaponry, which takes some of the fun out of the whole enterprise. Worse yet, it is frustratingly easy to pick up duplicate drops from engrams, especially on the Exotic and Legendary level. The frequency of duplicates is disheartening given how much time is invested in collecting materials to turn into the various Destiny 2 supporting cast. What good is collecting Tokens if it just means getting the same thing I already have equipped? Given the rich availability of different items in Destiny 2, it feels like duplicates shouldn't be this much of a problem. Destiny 2 offers three character classes: Titan, Warlock, and Hunter. Each class is simplified to suit a character's play style, offering distinct weaponry and abilities to complement their tank, support, and DPS roles. Figuring out which class works best for you is a big part of the experience, as is discovering which pieces of gear work best for those classes. Each class also gets several subclasses to build around, each of which specializes in a select handful of abilities and offers a different super ability. Playing around with the Sentinel's powerful melee Void shield and the Sunbreaker's giant hammer has been fun to experiment with, with certain subclass types feeling more suited for different situations than others. For example, I don't really need a Defender's bubble shield when taking on a giant campaign boss, but it does come in handy during a Strike or a Raid. Fortunately, Destiny 2 allows for players to equip two subclasses and switch between them. The downside of building these classes is that upgrading feels noticeably linear. Leveling a character and earning an upgrade point only gives me a single spot to use that upgrade point. I can't really customize my character, because I'm essentially forced to shoehorn that upgrade point in a certain place before I can access my character's other abilities. The choice expands slightly upon unlocking a second subclass, but I wish I could vary my character build more as I'm leveling up. Destiny 2 proves that the journey is more rewarding than the destination. Sure, I'll pick up duplicate or useless loot, but at least I had a good time along the way. And honestly, it's the kind of good time I could see myself having for a long time.